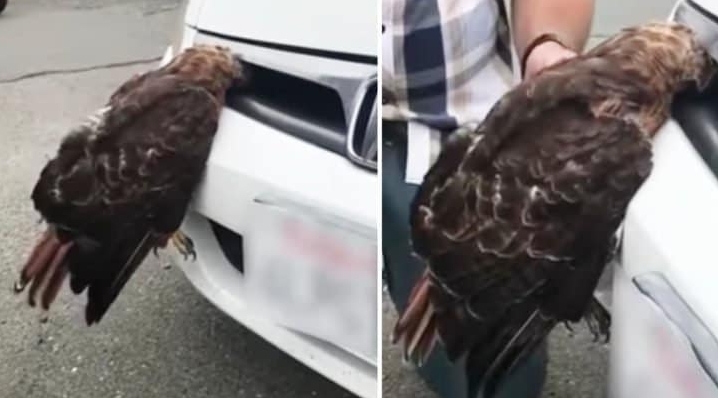 A man carries out a dramatic rescue of a red-tailed hawk that got struck by a car and then stuck in the grille of the vehicle. The bird is seen with its beak wedged into the front of a white Honda. Lynzee DeSantis said she was traveling about 55 miles an hour near Humboldt State University where she is a student, when the bird flew toward her car. She swerved to try and avoid hitting it and that's when the hawk's beak ended up stuck in the car's grille. DeSantis posted video of the harrowing situation on Facebook last Wednesday and thanked the total stranger who stopped to help. "Wow- Red Tailed Hawk hit my car and this really awesome guy saved him!!" DeSantis wrote in her post. The rescue unfolds on camera where you can hear DeSantis sounding concerned and frazzled. "Oh my gosh.. it's still, it's still alive. Poor thing," she says after another motorist came to the aid of the distressed animal. That motorist is Ryan Jensen. He tries to pull the bird from the car and then eventually goes to his vehicle to look for a "tool." Jensen, who is an artist, returns with a paint brush which he uses to carefully loosen the hawk's beak from the front of the car. It works. The bird is released and Jensen holds on to the frightened animal to make sure it's okay, checking to see if it injured its wings. "Holy cow! He's beautiful," DeSantis exclaims when she gets a good look at the hawk. Jensen continues to hold on to the bird, walks it over toward a grassy area and tries to comfort the animal which clearly appears to be traumatized by the entire ordeal. After about a minute, Jensen again uses his "tool," this time to hoist the bird up allowing the animal to curl its talons around the paint brush. The bird finally spreads its wings and gracefully flies away to DeSantis' delight. In her post the 26-year-old praised the heroic work of the stranger who stepped in to help. "I wanted to share the miracle and joy I felt in having this miracle happen and to highlight the kindness of a stranger, who didn't have to help me," DeSantis wrote. "I would've been freeing this bird on my own but because of him I had help. He is the hero, not me." What she may have not known is that the good Samaritan who came along to help is considered a hero in many sense of the word. Responses to "Red-tailed hawk rescued after getting stuck in car grille"